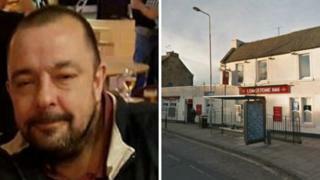 The death of a man following a disturbance near a pub in the south-west of Edinburgh is being treated as murder by police. Mark Squires, 44, from Edinburgh, was found with serious injuries in a lane next to the Longstone Inn on Longstone Road at about 01:30 on Sunday. He was taken to Edinburgh Royal Infirmary where he later died. Police are trying to trace a group of three men and two women who were in the area where the attack took place. Det Insp Dave Pinkney, of Police Scotland, said: "Our thoughts and deepest sympathies remain with Mark's family at this time and I would like to reassure them that we are utilising all resources at our disposal to identify the individuals involved in the disturbance leading to his death. "As part of this inquiry we are keen to speak with anyone who saw a group comprising of three men and two women in the area of the Longstone Inn at around 01:20 on Sunday 22 October. "If you believe you can help us identify the people within this group then please come forward. "We would also urge anyone with any further information relevant to this ongoing inquiry to get in touch."